Posted by Jon in Hasbro, NYCC 2018, Star Wars with 0 comments. 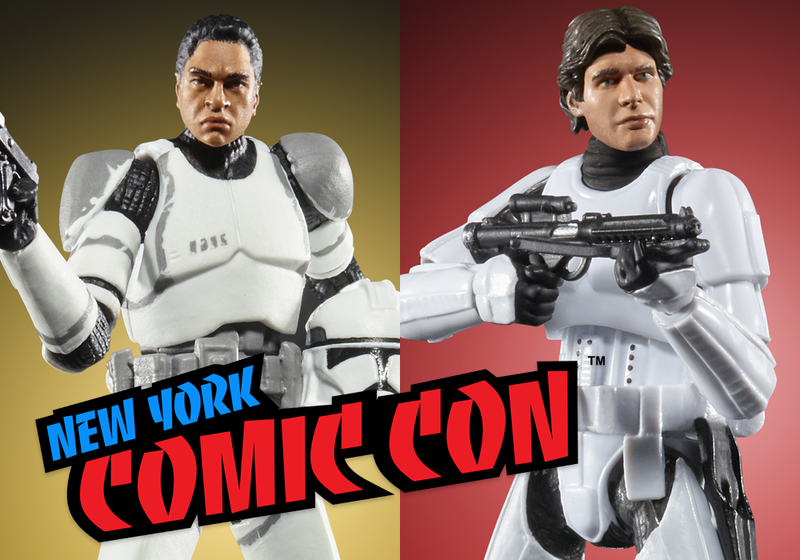 Today at New York Comic Convention 2018, SyFy hosted a live stream with Hasbro’s Star Wars division that, of course, resulted in some new reveals! The stream stayed pretty focused on the 3 3/4-inch Vintage Collection line, but we did get a preview of the new blister cards that the 6-inch Archive Collection will ship in. Sadly, it does not appear that SyFy is archiving these so I’ll be sure to post the Archive pictures when I get official ones. Anyways, on to the Vintage Collection reveals! First up, we have ourselves a new Han Solo in Stormtrooper Disguise. This figure will feature the face printing and a great Harrison Ford likeness! Next is the 41st Elite Corps Trooper. It was mentioned during the panel that this figure was originally done with improper deco. Then they went back and fixed it, but it was only released overseas. Now everybody can final. This figure will also feature face printing on his unmasked face.